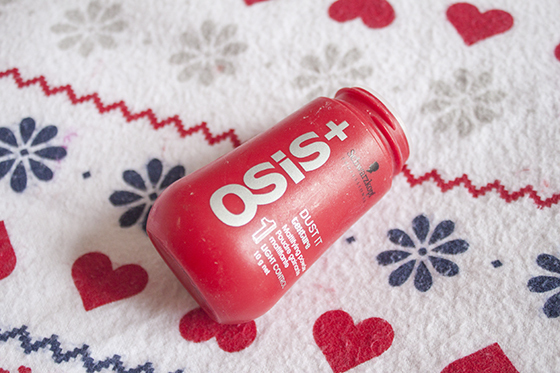 I'm shocked it's taken me this long to review one of these OSIS Dust It powders as I've been using them religiously for a good while now. It's basically a texuturising powder that you apply to the roots or mid lengths of the hair to give your hair body and volume without the need for backcombing. I use this in two ways, either by sectioning off parts of my hair around the crown and rubbing the products into my roots for a boost. Or occasionally I'll add it into the mid lengths of my hair when it's curly or wavy to give it some separation and volume. You don't have to use a lot of this powder to get a decent ammount of oomph and I think it adds so much to the volume of my long hair. The only downside to the product is that it does leave build up over time. I tend to go in with a good clarifying shampoo once a week to make sure all the product is removed. It does also feel a bit horrible in the hair, a little like that Oasis foam stuff that you use for flower arranging! Although there are tons of these on the market I do really like this OSIS one especially!